Five key facts about one of the Dow's fastest-growing payouts. Home Depot (NYSE:HD) recently announced a major increase to its dividend while promising to send shareholders a bigger portion of its earnings going forward. While the retailer typically reveals dividend changes as part of its fourth-quarter results, there were a few factors that made this latest announcement unusual. Here are five key takeaways for investors from the home improvement giant's updated capital return policy. Home Depot's 29% dividend hike this year represents its biggest since 2013's 34% spike. That increase followed a strong operating year for the company in which comparable-store sales jumped 5% and net earnings soared 26%. In the intervening fiscal years of 2013, 2014, and 2015, Home Depot raised its dividend by 21%, 26%, and 17%, respectively. This year's boost comes after the retailer significantly outperformed management's expectations, with comps rising 6% rather than the 5% they had initially targeted. The company paid out $3.4 billion in dividends over the last twelve months, which represents double the total that it sent to shareholders in 2013. 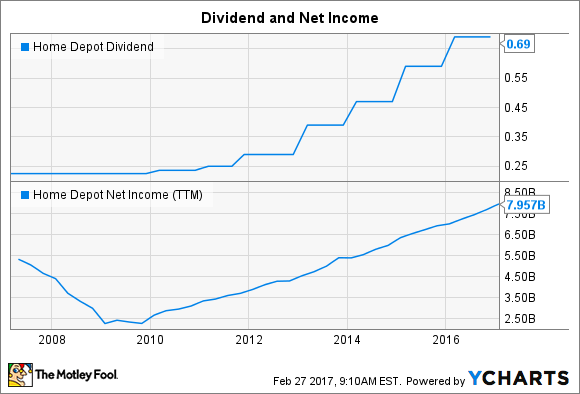 In fact, Home Depot is now paying out more in dividends than it booked in overall earnings just five years ago. Solid sales and profitability growth help explain this awesome track record. Comps grew at a market-beating 6% rate last year even as Home Depot's operating margin expanded toward 15% of sales. Rival Lowe's (NYSE:LOW), in contrast, is still stuck in the single digits and consistently trails Home Depot on comps as well. Lowe's dividend growth streak is more impressive than Home Depot's, given that it has raised its payout each year since going public in 1961. Home Depot had to pause its annual increases for three years during the worst of the housing crisis, which leaves Lowe's as the only home improvement retailer with an unbroken streak of at least 25 years of raises. Still, 2017 marks Home Depot's 30th year of paying a dividend and the quarterly payout has quadrupled since the company resumed annual raises in 2010. Home Depot made a significant shift to its capital allocation plans by raising the proportion of earnings it targets as dividends to 55% from 50%. That makes the company more generous than your average retailer, and far more generous than Lowe's, which aims to send just 35% of profits back to its investors each year. One good reason for the disconnect between the two home improvement giants is that Lowe's is still busy building out its store footprint while Home Depot hasn't added a new location in the U.S in years. That positioning leaves more money for management to plow back into business initiatives like increased e-commerce services, and also more cash at the end of the day for direct capital returns. Even after this latest raise, dividends represent a relatively small cash return channel for Home Depot. Management consistently leans more heavily on share repurchases than dividend payments. Over the last year stock buyback spending was $7 billion, or double the dividend outlay. While both return channels will benefit from increased cash this year, stock repurchases will likely remain the preferred option. CEO Craig Menear and his team plan to spend $5 billion on Home Depot's stock, which will boost per-share earnings and help the company inch toward its goal of 35% return on invested capital by 2018.